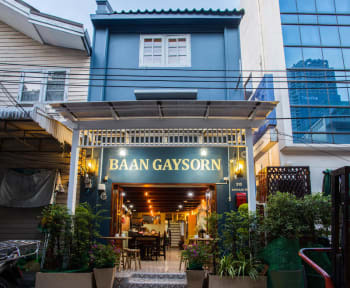 Baan Gaysorn Hostel is the 100-year-old house with the pass 4 generation to date. We love traveling and meet new stories and new experiences from friends around the globe. We are not that typical hostel nor guest house, but welcoming home for traveling guest. Please share your dream and we will take you to the new journey and experiences in our old town. 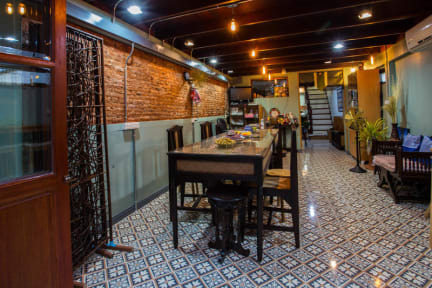 Baan Gaysorn Hostel is located in the hearth of the city. Our house is close to the convenience transportation just 1 minute walk to Saphan Taksin - BTS Skytrain Station, and only 3 minutes walk to Sathorn Pier nearby Chaophaya River (main river of Bangkok). This was a perfect homey hostel experience! The staff were very friendly and helpful and really made us feel welcome. The location is very convenient to get to and from a lot of places including the river/ferries. Breakfast was simple and ideal. Overall, This is a great place to stay if you’re looking for an easy hostel experience with all the essentials. Wonderful hospitality. Good vibrations here. Great location near lots of good food and markets all around. A calm place to come back to after a day in the wild city. I stayed here a few months ago and made a mental note to review this specific hostel because of how wonderful it was. I had such a fantastic experience here, and will be staying here the next time I come back to Bangkok! The owner is super loving and motherly, a very sweet lady. The location is right next to a sky train stop, and easy to access. It is also right next to a wonderful food market that the owner personally led us to. I could not recommend this place enough! Super cozy! Thanks for your hospitality and help with our day in Bangkok. Breakfast was much appreciated. Found this place perfect for me and my fiancée. Great location, friendly and helpful hosts. Couple of showers and clean room. Chilled atmosphere, some amazing street food just out the door. My weekend stay at Baan Gaysorn was great! It's easy to find, just off the BTS stop! The owner and her daughter were extremely kind and helpful. I plan on returning here in the future. I had a lovely stay at Baan Gaysorn. The hosts are very welcoming and kind, and the hostel is easy to find off the skytrain. Room was big, clean and air conditioned. The hosts made me coffee and gave me fruit in the mornings, as well as recommendations and any directions I needed for the day. Thank you so much! I cannot recommend this place highly enough! The lady who runs the guesthouse is just fantastic, and will really go the extra mile, from walking me to the ATM to talking on the phone with my taxi driver to make sure he picked me up in the right place. The rooms were clean and comfortable with great wifi and air con, and it was very central. Only downside for a solo traveler is there's not as much opportunity to meet new people, as it is maximum 10 people. But all in all well worth it! Quite a small hostel, only 2 rooms with 5 beds each so fantastic for a quieter stay. I was sent an email before arriving with a map of how to get there from the local sky train station which was very helpful. Close to the sky train and ferry terminal. Close to a 7-11 and Boots for the basics and off the main roads enough for peace and quiet. The owner/Manager is very helpful and walked with me to food markets and taxis when needed. Not near the main backpacker area (which is what I liked). The owners were very helpful very interested in their guests very friendly. Stairs are alittle steep but goes with the territory. Very good location for getting anywhere you want to go.